TIREE: A drake Green-winged Teal, 2CY White-tailed Eagle, 3CY Glaucous Gull, 1m Pochard and 4 Scaup at Loch a’ Phuill – also 13 Goldfinch & Fieldfare there. A Black-throated Diver and 1 Long-tailed Duck off Traigh Bhi. The 2CY Ring-billed Gull again at Greenhill – also juv Glaucous Gull there and the Glossy Ibis at Balevullin (John Bowler). COWAL: A 4CY Iceland Gull seen from Otter Ferry towards the middle of Loch Fyne today (Neil Hammatt). MID-ARGYLL: ABC trip to Ormsary today with a turnout of 8 folk and excellent viewing conditions on the loch – highlights from 54 species seen included – imm White-tailed Eagle, Peregrine, 21 Black-throated Divers, 4 Common Scoter, 6 Shelducks and 52 Goldeneye. Many thanks to Errol Crutchfield for leading the trip. Earlier 6 Slavonian Grebes were seen towards the head of Loch Caolisport. 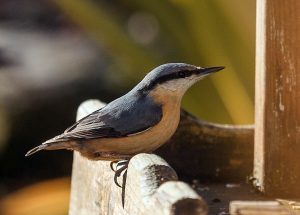 At Inveraray a Nuthatch from yesterday returned and was photographed (Joan Thomson). Nuthatch – Inveraray, Mid-Argyll 4th Feb (Joan Thomson).